These little parcels are very simple to make and are great for a midweek dinner. Serve them with some chips and some steamed veg for a filling dinner. Mince the garlic clove and finely chop the parsley. Mix them into the cream cheese and season the cream cheese well. Place each haddock fillet flat on a surface and cover them with cling film. Give them a bash with a rolling pin to flatten them slightly. Spread the cream cheese over each fillet and then top each fillet with a quarter of the spinach. Roll the haddock fillet up and wrap one ham slice around each fillet, then another ham slice around the fillet the other way round so that the haddock is entirely enclosed. Secure the haddock with cocktail sticks and then cook it in a 200C oven for 20 minutes. I made this yesterday for my evening meal. Rolling up the haddock and wrapping the parma ham around it was tricky and took me a couple of attempts, but it was totally worth it as it was delicious! 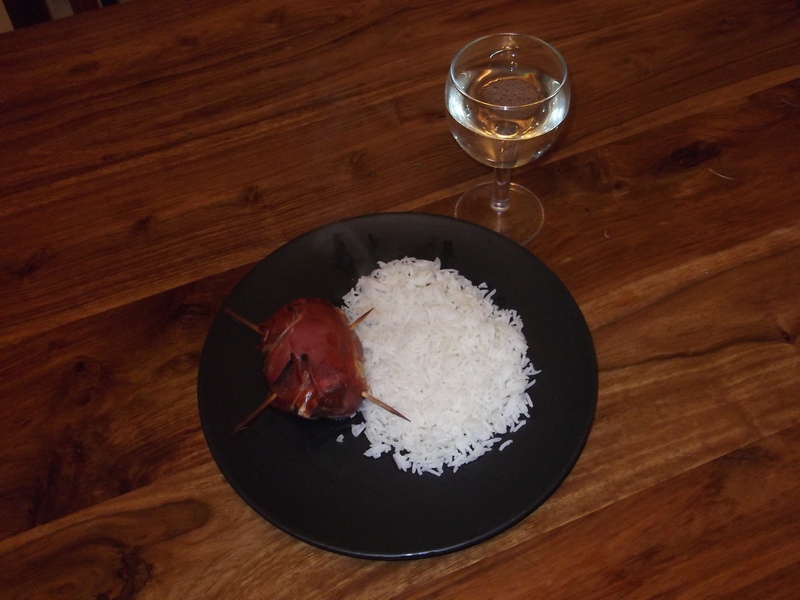 I served it with basmati rice and a glass of Pinot Grigio. Summary: These little parcels are very simple to make and are great for a midweek dinner. Serve them with some chips and some steamed veg for a filling dinner.